Not Craw… | Comics I Don't Understand - This site is now being updated daily at http://www.comicsidontunderstand.com. Please change your bookmark if necessary, and notify any web site with a link to the old address. and therefore presumably acts like an animal with claws. Of course, since this is a cat-like punchline, I recognize the possibility that I could be wrong. 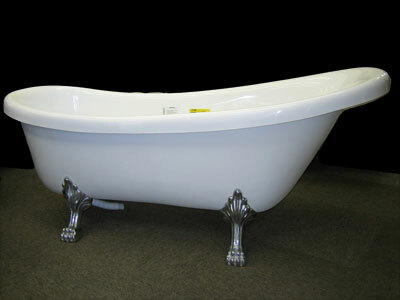 Well, I got that it was a clawfoot tub, but I still felt that there was something missing on the way to a punchline. 3. I’m overanalyzing; I should accept the most obvious explanation and move on. Is Close to Home EVER funny? “Not craw, CRAW!” is my all time favorite line. Would you believe… one of my ten favorite lines? I did send this one in, mostly because of Jim’s third point. I didn’t think I fully got it, but I did find it amusing. And I find Close to Home VERY funny at least 3 days a week, usually 4. Yes, Molly, that’s gross, but your commenting on it was funny! No, it never occurred to me that the woman was scratching. 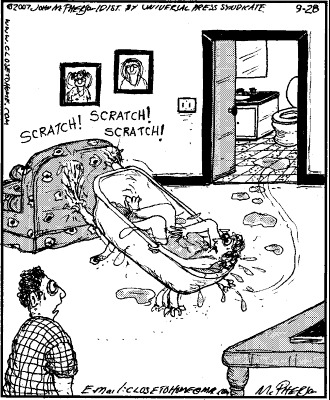 When I first saw “Close to Home”, years ago, it was right after Gary Larson retired “The Far Side”. I thought McPherson was doing a cheap knockoff (“close”/”far”), plus I didn’t like his “messy” drawing style. But the “strip” has grown on me over the years. He has a bizarre and inventive imagination–and I will always appreciate that…whether TV, books, etc. I loathe Close to Home. The main problem with me (asides from the terrible drawing) is that generally it’s a half-decent set-up in the drawing, with a caption that spells out the joke in too much detail. Unfortunately, generally the illustration on its own doesn’t make quite enough sense to be funny, but the added caption removes all humor by making it obvious. How about slightly below a Mallard Fillmore punchline.